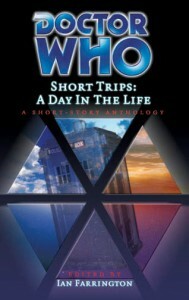 Of all my published Doctor Who work, I think I like Waiting for Jeremy the most. I was already talking with Ian Farrington – then Short Trips range editor – about the possibility of editing a collection myself (which would eventually become Transmissions) but in the meantime, Ian said he was editing one and I asked if I could pitch an idea. I knew I had to set my story within the space of one hour to fit with the collection’s premise, but nobody said anything about that hour having to be spent all in the same year. Thus I had the story jump around in time but stay at the same time of day. But that’s not why I like this one best. It’s more because it’s a story about hope, about lost causes and about hanging on to an idea of something even when the reality turns out to be disappointing. Everyone else probably thought it was rubbish, but for me it marked a turning point in my writing, a certain maturity I think, where a story became more about the themes and ideas and less about characters performing plot points until a conclusion is reached. Waiting for Jeremy — Richard Salter — Salter has always demonstrated an excellent grasp of the regular characters, and he continues it here, presenting a sympathetic Hartnell and capturing the mercurial Steven better than most. It’s their differing reactions to the “lesson” that elevate this story, and it’s very good indeed — but that last line jars more than a little.